For one day in June this year, all eyes in London were on the River Thames. To commemorate the Diamond Jubilee of Her Majesty the Queen, we were treated to a thrilling spectacle as over a thousand boats of all shapes, sizes and colours made their way down the river through the heart of the capital. The cheering crowds that lined the river, some of whom had camped overnight to get the best possible view, along with the millions watching on television, were witnessing an event nothing like which had taken place in any of their lifetimes. 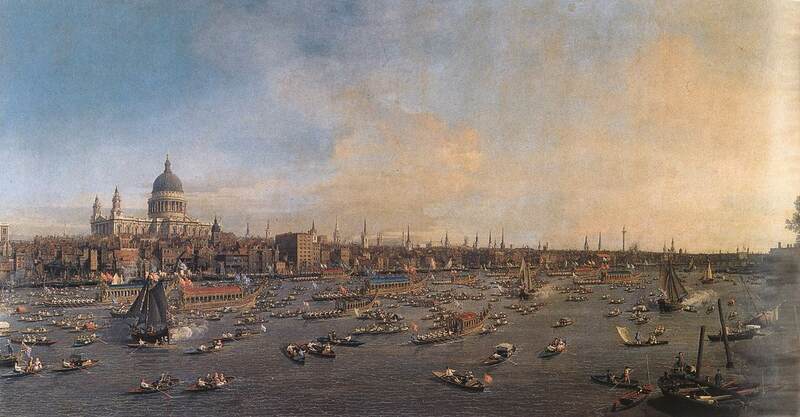 In fact, as the TV coverage repeatedly reminded us, the last time there were this many boats on the Thames was in the seventeenth century, for the coronation procession of Charles II’s wife Catherine of Braganza. It was this fact that really struck me. It stuck me even more than the noise, the colour, even more than the delightful sight of a choir on a floating barge singing, whilst trying to stifle giggles, ‘Land of Hope and Glory’ in driving rain. The fact that this was the first time that the Thames had been the centre of London’s attention for so long, that this was the first day in centuries that the city had come together on the river, made a lasting impression on me. Perhaps even more striking is the fact that, far from the once-in-a-lifetime occurrence it has seemingly become in the modern era, until 200-or-so years ago events of this type were relatively common on the River Thames. Today millions of Londoners regard the Thames as, at best, the backdrop to a romantic stroll along the embankment or to a tourist snap, or at worst a thing they pass over on their way to work without thinking about. And yet for most of the city’s history, the river Thames was London, and London was the river Thames. With perfect timing, in this jubilee year, the Royal Maritime Museum in Greenwich – together with guest curator David Starkey – have put together an exhibition that tells the fascinating story of the Thames and its relationship with our capital city. The fact that London, like most major cities in the world, owes its very existence to the river on which it was built is of course well-known, as is the fact that London was, for most of its history, one of the most important ports in the world, courtesy of its riverside location. The Thames was also, like most major rivers in the world, a vital transport link. But what is less understood, and is at the heart of the Royal Maritime Museum’s exhibition, is how the River Thames for centuries served as the arena for a significant proportion of the city’s large-scale public events – indeed, once upon a time any event of sufficient scale or grandeur seemed to more-or-less require the Thames as a venue. The title of the exhibition, ‘Royal River: Power, Paegentry and the Thames‘ actually does it a slight disservice, for what is explored here is not just how the river was used for grand royal occasions, particularly by the Tudor and Stuart monarchs to showcase their power and wealth, but also how the Thames provided the setting for all manor of grand public spectacles that took place in London, royal or otherwise. 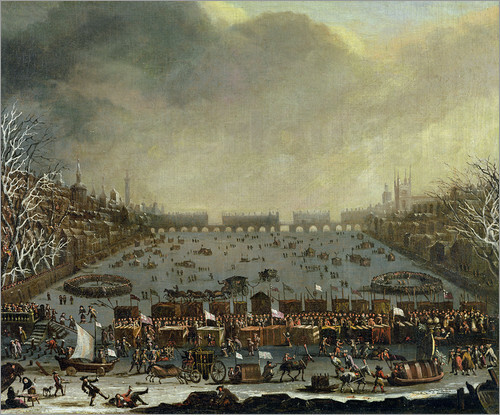 Funeral processions (Nelson, Churchill, et al), concerts (especially in the eighteenth century, usually involving Handel), firework displays (usually to celebrate the end of a war) and frost fairs (more on those a bit later) all used London’s river as their stage. The exhibition also charts the history of the Thames as London’s superhighway, the only way to travel in London if one wanted to get from ‘a to b’ relatively quickly and in relative comfort, and avoid the narrow, congested and foul-smelling streets. And finally, we get to see how, as London’s population exploded in the industrial revolution, its river gradually turned into a revolting, disease-spreading sewer. 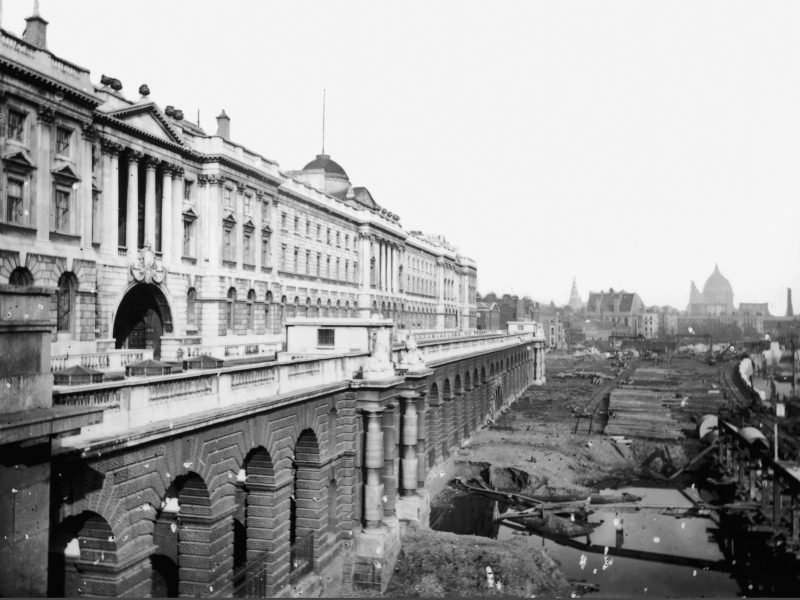 As a dedicated section of the exhibition serves to remind us, Joseph Bazzelgette’s Thames embankments and underground sewer system was probably the most important step London ever took in becoming a modern city, and it remains the greatest of all Victorian civil engineering achievements, but it marked the final death knell for the Thames as a setting for public events and as the city’s principal transport hub. Canaletto’s beautiful panorama of the Thames on Lord Mayor’s Day opens the exhibit, and while it will immediately seem familiar to anyone who watched television or picked up a newspaper in the days following the jubilee pageant, it is wonderful to get this close to the original and marvel at all the finer details. Several other very large paintings follow (my favourite being of a pageant passing Whitehall, the largest palace in Europe until in burnt down in 1698, featuring a tiny king Charles II waving at the passing boats), but on the whole the objects featured are extremely varied, from pieces of boats to hand-written sheet music for Handel’s Water Music performed for George I from a barge in 1717. Some of the objects may, on the face of it, have nothing to do with the river Thames, but are intriguing anyway (a prayer book containing a hastily-scrawled note in the margin by Anne Boleyn as she and Henry VIII exchanged lines of love poetry during a mass, anyone?). And besides, the bringing together of some of these seemingly random and unrelated objects by this exhibition serve as a nice metaphor for how all aspects of London life were once connected to the river Thames in some way or another. A Londoner of the seventeenth century may have, for instance, used the river to travel to work every day, could have had a friend or relative employed as a Thames waterman, or might have met their partner during a Thames frost fair one winter when the river froze over. And, almost certainly, our seventeenth century Londoner would have witnessed several Royal pageants during their lifetime, along with a Lord Mayor’s pageant or two, which took place every year and featured a lavishly decorated boat representing each of the City of London’s livery companies. These boats and their ornamentation make up one entire section of the exhibition. As for the the prayer book, it was, incidentally, in a section all about how Henry VIII used the river to travel between his four principal palaces – Hampton Court, Richmond, Whitehall and Greenwich – and London (as one enormous map in this section so beautifully illustrates, even the outermost extremities of the city were located a long way from these palaces in those days). Also, when he married Anne Boleyn (in, to put it midly, controversial circumstances in 1533) he used to river to win over the hitherto skeptical English public, and put on a spectacular pageant of unprecedented scale intended to showcase the beauty and majesty of his new wife, and the people’s new Queen. Henry VIII’s successors repeatedly sought to outdo him, as throughout the sixteenth and seventeenth centuries coronations and royal weddings went hand-in-hand with increasingly grand river processions. We get to see all sorts of related objects to these events, my favourite being some slightly naff and rather charming crockery made to mark the coronation of James II and Mary of Modena in 1685, complete with royal crest, the year and the king and queen’s initials. If I had the opportunity to chose one event to travel back in time to witness, however, there is one that would easily trump all of the pageants, processions and royal razzmatazz – a Thames frost fair. It is a scene almost impossible to imagine now: the River Thames completely covered in ice, some winters several feet thick (thick enough so that at one frost fair, to the delight of the assembled crowds, an elephant was walked from one side of the river to the other), crammed with market stalls, sports tournaments, and all manor of entertainments and amusements from music to bare-baiting. The main reason the Thames does not freeze over during even the coldest winters today is that, since the construction of the embankments in the nineteenth century, it is too narrow, too deep and too fast-flowing for ice to form (it is also worth noting that many of the winters of the sixteenth and seventeenth century happened to be particularly cold courtesy of a period of global cooling known as the ‘mini Ice-Age’ – the first recorded frost fair was in 1608 and the last in 1814). And so therefore, unlike the Royal river pageant, the frost fair is something that can never be brought back to London, and knowing this that makes objects like the souvenir cup, bought at a Frost fair stall and inscribed with the words ‘bought on ye Thames ice, Janu ye 17 1684’, all the more enchanting. It’s probably my favourite of all the treasures in this exhibition. Tags: 17th century, 18th century, Anne Boleyn, canaletto, Charles II, coronation, coronation procession, Cutty Sark, david starkey, exhibition reviews london, exhibitions london, frost fair, Henry VIII, James II, Joseph Bazzelgette, jubilee pageant, London, Lord Mayor of London, Lord Mayor's Day, mini ice age, national maritime museum, paegentry, pageantry, painting, power, queen, River Thames, royal river, Royal River review, Stuart, The Queen, Tudor, Victorian, whitehall palace, Winston Churchill. Bookmark the permalink.